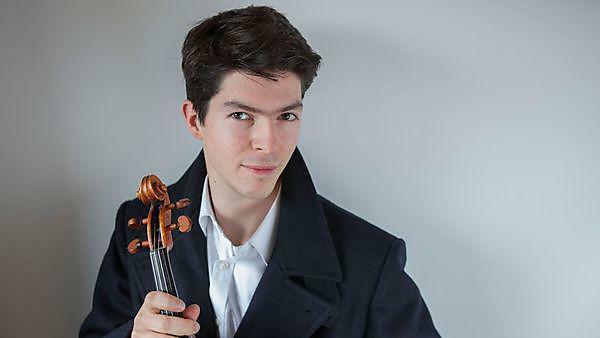 Growing up in a musical family in southern France, Pierre-Emmanuel Largeron first knew he wanted to be a violinist at the age of two. At the time, there was the small complication that he wasn’t tall enough to hold – let only play – the instrument. But just under a quarter of a century later, the University of Plymouth student’s early ambition has very much been translated into reality. And his successes have just seen him receive one of seven Trophées des Français de l’etranger 2017, which celebrate the achievements of French expatriates and francophones around the world. Organised by lepetitjournal.com, in partnership with national government, business and media, the awards on Tuesday 7 March were attended by more than 300 personalities, including political and institutional decision-makers. Pierre is currently in the final year of a PhD, working alongside Professor Eduardo Miranda in the University's Interdisciplinary Centre for Computer Music Research (ICCMR). Before that, he enjoyed spells as a performance musician in respected venues across France, and studied performance at the Royal Academy of Music in London. That sentiment of international collaboration is something which is inspiring Pierre’s PhD, and he is now in the third year of his programme with the ICCMR. The main focus of his work is around using digital platforms to enhance audience participation, particularly with relation to the internet. His ambition is that someone could be anywhere in the world but still be able to appreciate, and even participate in, live performances. The technology he is playing a role in developing has been used at the last two Peninsula Arts Contemporary Music Festivals, held at the University, but Pierre is now expanding that to make it accessible to wider audiences. While in Plymouth, Pierre has also continued to perform, appearing as the soloist alongside the Ten Tors Orchestra in June 2015 and working with Peninsula Arts to organise a series of maritime themed concerts in 2015 and 2016.